Yellow Label tents are the best choice if light weight is your highest priority and if you travel in the snow-free months and in protected terrain, or in warmer climates. We engineer our Yellow Label tents principally to be lightweight. 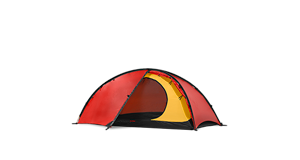 Intended for use in warmer climates and in snow-free conditions, these models have inner tents with large mesh panels which cannot be covered, and shorter outer tent walls. This ensures they have superb warm-weather venting, but can also make them feel cold in cooler conditions. Yellow Label models are perfect for long or short trips in more protected terrain, but, while they do have remarkable strength, their lighter weight materials and their design make them less than ideal for fully exposed or high altitude terrain or remote adventures. 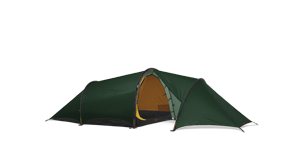 Our Kerlon 1000 outer tent fabric, with an 8 kg/17.6 lb tear strength. Our lightest inner tent and floor fabrics. 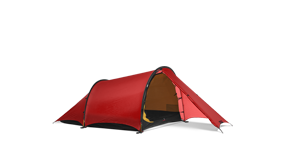 Outer tent does not go all the way to the ground, offering a lightweight balance of weather protection and constant air flow. Large, fixed mesh panels on the inner tent and shorter outer tent walls create constant cooling air flow (which can feel cold in cooler conditions). The interior is designed to maximize light weight while providing sufficient roominess. The Anjan and Anjan GT models are excellent backpacking tents for any trip during the snow-free months of the year, such as here, in eastern Washington, USA. Photo: Petra Hilleberg. Yellow Label tents offer full rain protection, but they also offer outstanding ventilation for warm weather comfort. The entire back wall of the Anjan (on the left) can be rolled back to expose the large mesh vent on the inner tent, and both vestibules of the Rogen (on the right) can be fully rolled away to allow unrestricted air flow through the inner tent’s nearly full mesh doors. 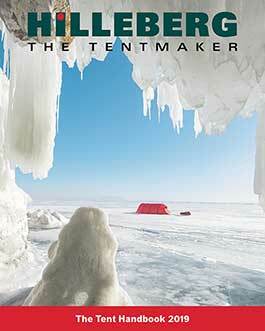 Photo: Jon Dykes/Hilleberg Team. 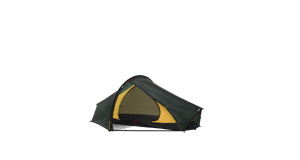 Yellow Label tents offer the consummate warm weather, lightweight, backcountry shelter solution and users willing to give up comfort for super light weight will find their inherent strength equal to surprisingly tough challenges. 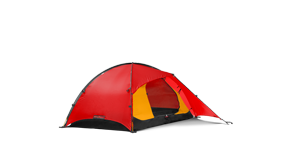 Yellow Label tents offer lightweight backcountry shelter for a warm weather.